I'd like to introduce you all to Hank, the newest member of our family. Isn't he gorgeous? Hank is an Irish Doodle, Dad is an Irish Setter and Mom is a standard Poodle. Hank was born on October 26, 2017 and was adopted on January 14, 2018. He is so wonderful and we are all a bit giddy over him. I mean we stare at him and think every little thing he does is marvelous. I wasn't really intending on getting a puppy quite so soon. I have been watching adds in the paper and looking at the thousands of websites out there. Nowadays you have to fill out applications online and put down deposits not really knowing what puppy you will get and when of course. I was really overwhelmed by it all. When we got Max we saw an add in the paper, called up and drove a few hours north to get him the very next day. There was a litter of 7 pups and Max picked us out the second we got there. Now it is not that simple. 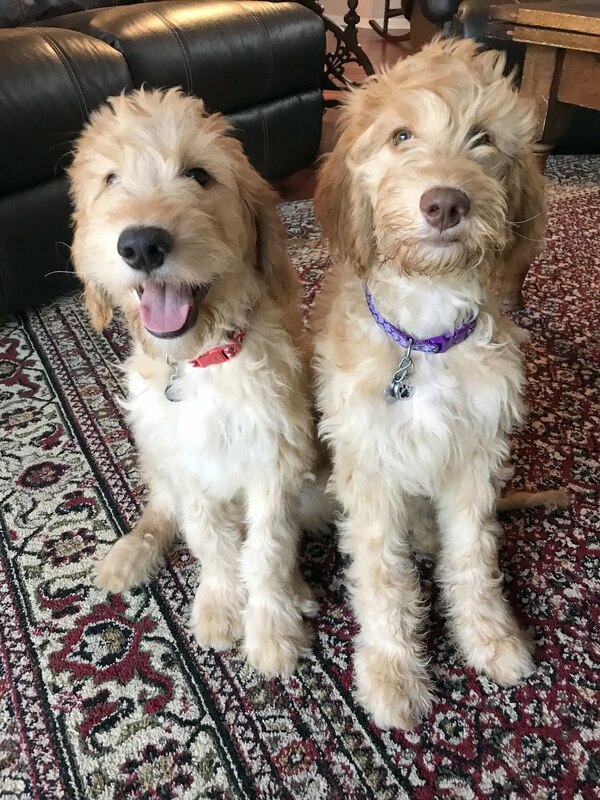 I have been looking and wondering how to make it a bit easier when I saw an advertisement in the paper about Irish Doodle pups. I had never heard of them so I looked them up and was just amazed by their cuteness. I called, left my number, and got no call in return. I let it go thinking they were all taken but then the next Sunday there it was again. I started to see it every day and last week I called again. I immediately got text messages telling me there were four pups, one black girl, one black boy, one blond boy and one rare chocolate brown boy. After a bit of discussion texting back and forth on Friday evening, we asked to see them and it was arranged for last Sunday, when Mr. 20 could drive over and join us. Can I say that when we saw this little boy our hearts collectively melted? He stood out in a sea of dark squirming puppies. He just sat there looking at us, like saying finally you are all here. My husband picked him up and Hank snuggled right in, he was passed to each older boy and finally to me, and frankly we didn't even have to look at the other ones. They were cute and all but we had found our boy. It is funny, Max left such a hole in our hearts when he left us. Hank, with his brown nose and deep green eyes is set to fill that hole up again. He won't be Max, we wouldn't want that, we want him to just be Hank. We are a better family with a dog, does that even make sense? We are softer and kinder. We make silly sounds and talk in baby voices and get all sappy and silly with a dog. Little Buddy is beside himself excited. They wrestle and Little B gets jumped on and his ears nipped at, we are trying to put a stop to that but Hank is a baby after all. Little Buddy and Hank will grow up together, every little boy or girl needs that uncompromising, unconditional love. We all do. Be prepared for puppy overload my friends, I mean how can you not take a million photos of this adorable boy? My oldest son named him just in case you were wondering. Only after we had decided on the name did I tell him what a hank of yarn was. He is adorable! I am so glad he found you! Sometimes a furry love comes to us when we least expect it. Little Buddy will enjoy having this dog to grow up with. I am so happy for all of you. Hugs!! Oh and bring on the pictures!! What a sweetie. And I totally understand about holes. When Tux died, there was a HUGE one. Rupert helped a little, but it's really Burton who's helped it heal. Tux will always have a spot in my heart, but it's nice that that spot doesn't ache anymore. He is adorable, the perfect addition to your family. I love the name, perfect for you. The joy is just flowing out of Buddy, that one picture tells a future filled with mutual love. Congratulations, he is just cuter than can be. I know what you mean about being a better family, having a dog. Somehow they just bring everyone together, bringing out the soft side of every person in the family. Like you said, the baby talk and silliness. And, when there are disputes between family members, the dog is someone that everyone can agree to love. They are just goodness all around. Oh my, you've definitely picked a winner. Never heard of an Irish Doodle before, but he's so cute. I know what you mean about the dog competing the family. He is so precious. Congratulations on your new little one. How special that he and LB will grow up together. Enjoy! Squeeeeeee........!!!! When Dear Departed Doggie went to heaven I said no more dogs and then....I couldn't stop looking at dogs on the internet. That's how Pup came to be and it was the best thing ever to fill up that hole in my heart. I'm sure Dear Old Doggie would have approved. Hank is adorable!!! I love puppies. Awww!!! What a cutie! I recently saw a Saint Bernard-poodle mix. I wanted to spin his fur - it was in ringlets. I think my next dog will be a poodle mix - tired of the shedding. Cute and wow look at the feet of that baby. What an armful of love for everyone. Looking forward to watching Hank grow up surrounded by his new family. Hugs. Congratulations on Mr. Hank! I love the story of you all meeting. Super sweet. Much love and happiness to you all. Congratulations! He is indeed a beautiful boy and looks just perfect with the other three. I am not a dog person, but my vet-school son is obsessed with them, and he would completely agree that a dog makes a family better. LB and Hank are bound to be the best of friends! I'm so, so happy for you and your family! Hank is so cute, and I know he's bringing all of you a lot of joy. Thanks for the low down on how difficult it is to adopt a pet right now. My daughter had to go through a lot of red tape to adopt her rescue, who had been in the shelter for 8 months. A good thing in the end, animal abuse is terrible. Also, they want everything to be a good fit. Congratulations! Hank is adorable. So glad he found you. Welcome Hank!! You'll have the best home a dog can get! I'm so thrilled for you and your family. I know that Max will have left a great gaping hole in all of your hearts and only the love of another puppy will help that to heal. Hank is such a beautiful boy and I can see that he's going to get totally spoilt, just as he should. I never made the connection between his name and yarn until you pointed it out but how perfect is that? Congratulations! Such a cute puppy!I totally agree that dogs make a family better. What a cute pup! Welcome Hank to your new, loving home! Oh my. What a cute pup. You are about to be Even Busier now! Oh my!! Cuteness overload! It's going to be fun to watch him as he grows up with your family. Take lots of pictures while he's still a puppy! It doesn't last nearly long enough. Oh my gosh! Hank is Adorable!! Congrats on the family expansion. Wow.He is gorgeous!He looks to have huge paws .Does that mean he is going to grow big?Enjoy him. I've been so behind in my blog reading and Oh My Goodness....I am so happy to see what you've been up to! How fun is this going to be for you all!? Hank is adorable and there's that Little B smile that I'm so fond of! I just can't wait to see all the upcomming puppy news! I'm in love. Now I'm going to bug a lady who has absolutely no time for more photos. I'm jealous. I'm thrilled for you at the same time. Hank? Well cmon, that's perfect. This is going to be a really great match for LIl Buddy. Responsibility and joy at the same time. Maybe if we lived in a warmer climate Fireman would cave in on my dog requests. All of your son's look so handsome holding that boy. You look so happy. Max sent him of course. I think we are ALL better people when we have pets. I know how much Max meant to you and how much Giroux means to me. Unconditional love going BOTH ways!!! So, post away ...........Hank is adorable. Little Buddy is cute! Add them together and oh my lordy ...........too much and I say BRING IT ON!!! Congrats on the newest Morgan! Welcome, sweet boy! Nothing heals the heart like a puppy. Wishing you many years of happiness and love with Hank. Congratulations on adopting Hank into your family! He is a beautiful and sweet pup. We had an Irish Setter in our large family and she was a sweetheart who loved to RUN. I hope you enjoy your new addition to the family! Well, you know it IS the Chinese Year of the Dog! Give him a kiss from me. I'm so happy for all of you; and happy for the pup to find such a nice home! Enjoy getting to know each other! Yay! You got a puppy! Keep those photos coming; he's adorable! So happy you are filling the hole in your hearts by giving a loving home to another pet! That is so exciting that you got a puppy! I love the name and when I went to read your post, I thought you were going to talk about a hank of yarn you bought! The perfect name for a knitter/crocheter's dog :) He is so cute! It is so nice to get a new pet and as you said, you aren't trying to replace Max they are different and he will always be special to you all. Welcome Hank! Looking forward to seeing more photos! Cute puppy and glad you got one that liked right away. That's the best way to pick one out! Love the photos too! Enjoy! Hank is so adorable! I'm looking forward to seeing him more. Welcome, Hank! What a sweetheart. Gorgeous, and I am not usually a doggy person. Bring on the Hank posts! I saw Claudia's Instagram post introducing Hank! So happy that you got a sweet new puppy. He is gorgeous. A new baby!He is beautiful! How wonderful for Buddy, You and your family. I m not ready yet for a new Pup since Angie passed past year. Plus We're traveling too much, but my heart is sooooo ready. CONGRATULATIONS and have fun with the new family addition! I was so amused to read that your beautiful baby boy is named Hank. I wondered whether it was chosen due to the yarn connection. You won't believe this but I promise this is true - when we were naming our last little Dutch bunny, Max, one of the first names thrown into the ring was Hank - we were looking for a typical Dutch name for a Dutch bunny breed. When I saw that you had named your boy Hank, I was totally floored by the coincidence. You said you were a better family with a dog and I love your reasons for saying so. I had never thought of a pet's role in a family in that way but you are so right. About all of it, including the unconditional love that children need that is so easily satisfied with the bond of a pet. O, wow, so lovely is this new dog, Hank! You're all smiling! So much cuteness! Welcome Hank! You hit the family jackpot. So happy for all of you and Hank is absolutely adorable!